Superman is the Rodney Dangerfield of superheroes. He gets no respect. People claim he’s boring because he has all the powers. It’s the one chink in his invincibility. 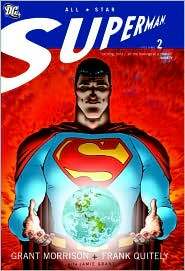 But people are wrong, and All-Star Superman Volumes 1 & 2 proves that. Writer Grant Morrison, artist Frank Quitely, and inker Jamie Grant have taken what we think we know about ol’ Supes and turned it right upside down. Never have I read a superhero novel with so much depth and emotional honesty. Here we find Superman struggling with his own mortality. See? He isn’t as invincible as everyone thinks. Instead, he’s been poisoned by the sun, the source of his powers, thanks to the dastardly hijinks of arch-nemesis Lex Luthor. There’s all kinds of superhero world-saving, space-going, time-traveling, and alternate-universe-visiting going on here and while that’s all entertaining it only acts as the plot line that drives the story. The story being about one man coming to terms with his death and how to leave his loved ones behind. Of course, because he is Superman he has to save the world about 88 times while dealing with all this. These books are so full of awesome that I don’t even know where to begin. So I won’t. I am just going to share with you some of the best bits. Supes takes Lois Lane up to the Fortress of Solitude, which is filled with S-sporting, cape-wearing robots. Also, the key to the fortress is made out of some kind of 50jillion-pound metal that only someone like Superman can lift. He keeps it under the doormat. At one point Superman has to go to Bizzaro world in the underverse. It’s like opposite land, where Flash is really slow, and everyone is dumb and lives in a garbage dump sort of. Except Zibarro, who is the underverse’s own Superman. He’s the poet alone on a planet full of illiterate people. Against what he want Zibarro gets a nearly-dead Superman back to Earth. It’s kind of heartbreaking, and really mirrors Superman’s own story, being the only one of his kind. I think that’s why Superman has always appealed to me. He is the only one of his kind, he doesn’t fit in, it’s like the very definition of loneliness. As a 6’5″ woman who is the only child of her biological parents’ union, I can relate. However, I cannot fly. It will give you goosebumps, and nearly bring you to tears. But my absolute favorite part, the part that gets to the true crux of why Superman is the best and Batman is nothing but a Republican with a nice belt, well, I can’t find that part anymore. But what it shows is Superman battling some villain, and the villain asks Superman why he keeps saving the human race when they’re so damn annoying. “Who am I to impose my morality on them?” Superman asks, and I had to bounce up and down in my chair chanting “yes, yes, yes.” It was such an awesome moment. It just shows what an intellectual Superman is, that he thinks about all the things he does and why he does them. Batman, on the other hand, is out for revenge and teaching Gotham City to be more like he thinks it should be.